For me, being casual and comfortable is so important. It’s probably the most important thing when it comes to getting dressed in the morning (or whenever I decide to get out of my pjs). This dress is both casual, comfy and cute! I’m obsessed with it. I love the t-shirt silhouette and how soft the fabric is. Also, not to mention I love the olive color! It also comes in black and is under $45. This is a dress I will be wearing probably way too many times throughout the year and I’ll be ordering the black, too! I paired it with a denim jacket around my waist to add a little something and my leopard flats (of course). This denim jacket is a great price and so comfortable. I actually have all three shades! What a cute casual look. I love it! Have a great time in NYC. Bundle up it’s freeeezing up there. I love that dress! Have so much fun in New York, I heard the weather has been all over the place! So cute! 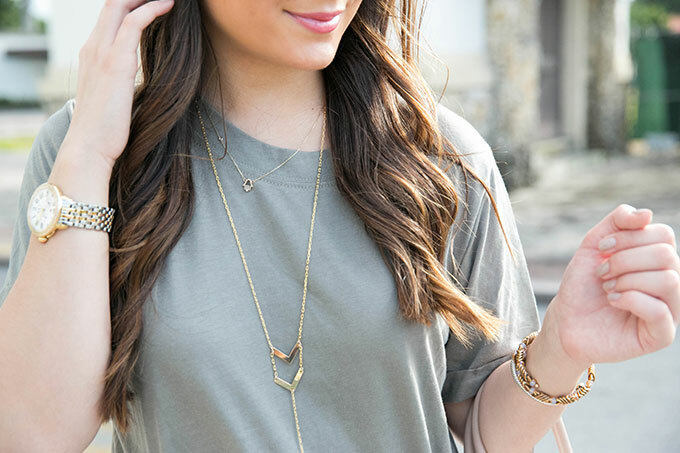 Love your necklaces! Great outfit for chill weekends spent running errands. You always look so cute and your hair is always on point. Good luck packing for NYC! T-shirt dresses are my favorite. I am loving those fierce shoes! In love with that comfy t dress! Too cute! I love everything about this look! The leopard print shoes and the denim around the waist were the perfect touches! Gorgeous flats!!! My favorite pair of flats are leopard (but they are so old and starting to fall apart 🙁 ) so this post makes me want new ones haha! SO cute! You look amazing in anything! Love love LOVE this outfit. So cute and effortless!! I love a good Tobi find, too!! They have some of the best stuff for the best prices! Such a simple look – I love Chole flats.